Lewis Hole went past 300 goals for Little Common Football Club with a double in the 3-1 win away to Billingshurst. Lewis Hole scored his 300th and 301st goals for Little Common Football Club in a come-from-behind 3-1 win at Billingshurst yesterday (Saturday). 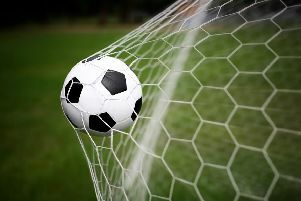 Lewis Parsons also hit the net as Common hit straight back from their heavy defeat to Lingfield the previous weekend and returned to the Macron Store Southern Combination League Division One summit. The Commoners were missing Harry Saville and Louis Walker, but gave a debut to new signing Ryan Paul at right-back with Adam Smith and James Maynard also coming into the starting XI. Common started brightly and almost took an early lead, but Jamie Crone saw his goalbound effort blocked. Hole then thought he had given Common the lead from Wes Tate’s cross, but his effort was ruled out for offside. Somewhat against the run of play, the hosts took the lead in the ninth minute. Jake Chadwick beat three players on the edge of the Common area before squeezing the ball through Matt Cruttwell’s legs. Common continued to press and create opportunities, with Crone seeing an effort blocked before Sam Ellis had a shot turned round the post. Parsons almost brought Common level from a Russell Eldridge free kick, but saw his header fall just the wrong side of the post. The same players combined for the equaliser in the 42nd minute, with Parsons planting a diving header beyond the home goalkeeper. Two minutes later and Common were in front. Ellis delivered a cross into the area and the ball fell to the feet of Hole, who made no mistake from eight yards to mark an historic moment and a remarkable achievement. The Commoners looked to add to their tally at the beginning of the second period, with Crone seeing an effort saved and Parsons having a shot cleared off the line. The home side did enjoy a spell of pressure, but never really threatened Cruttwell in the Common goal, although he was called upon to push one effort round the post. Crone saw a superb run and cross just elude Hole before Smith blazed an effort over. The game was made safe 15 minutes from time when Charlie Bachellier played a throughball to Hole, who finished from just inside the area to cap a fine afternoon. Common: Cruttwell, Paul, Maynard, Ward, Parsons, Eldridge, Smith (Bachellier), Tate, Hole (Spice), Crone, Ellis.